The M4 Sherman is one of the most iconic and recognizable tanks of all time, with nearly 50,000 produced between 1942 and 1955. Because of its long production run, the tank served through most of the U.S. involvement in World War II and on through the Korean War. The Sherman is an incredibly well-documented vehicle, and popular enough with plastic modelers that there’s a wealth of reference pictures available online and in books, from historical photos to detailed schematics and high-res close-ups of surviving tanks in museums. 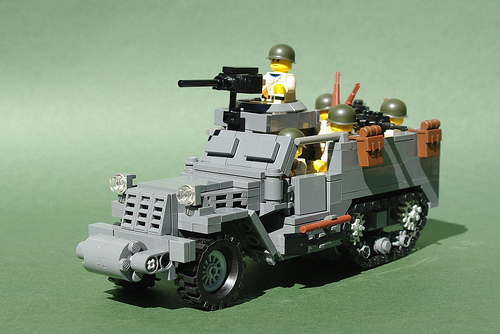 With so many production variants (animated GIF illustrating three of the most common ones on the right) and tank crews’ penchant for customizing their vehicles in the field, it’s also a great choice as inspiration for a LEGO model — you can definitely put your own spin on it. 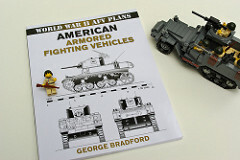 After I’d tried my hand with LEGO World War II models with a couple of small Jeeps and a simple Higgins Boat for my Omaha Beach diorama, I knew I had to tackle a bigger vehicle, and I quickly settled on the M4A3 Sherman, which I included in my diorama depicting the liberation of Cherbourg. Here’s my M4A3 (76)W Sherman variant on the right with Dan Siskind’s Brickmania M4 Sherman that I’ll be reviewing on the left. It feels a little odd reviewing these two models as a comparison for two reasons. First, they’re very different variants. Dan’s M4 reflects earlier (initial M4 or M4A1), much more rounded hull design with a 75mm gun while mine is the mid/late-war M4A3 with an angular hull and the much-larger 76mm gun (with its correspondingly longer turret). Side note: Remember how I said just how well-documented Shermans are? Prepare for this review to get occasionally technical about tank details. Bogies will be mentioned. On my tank, the tread/suspension section is taller than a minifig. Dan has managed to shave at least two plates’ worth of height off the most-common LEGO Sherman designs, but at the expense of several details most other LEGO versions include, like the larger front drive sprocket compared to the smaller rear idler, and even the bogies (hey I warned you!). Which brings me to the price for Dan’s kit. I won’t go into the price-for-value issue again in this post (read my WC54 post for that), but the kit I’m reviewing is $165 for 505 pieces. 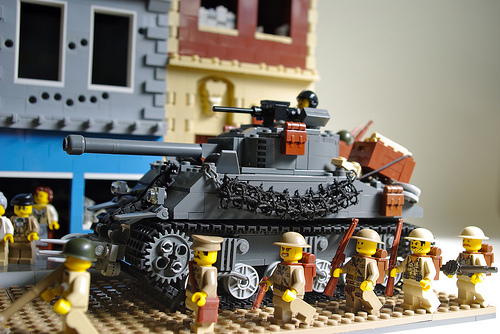 For $350, Dan also sells his M4A3(76)W Sherman as a “premium kit” built from 796 pieces that includes a 4-minifig crew. The difference — both between Dan’s two Shermans and between his $165 version and my own — is a matter of scale versus detail. 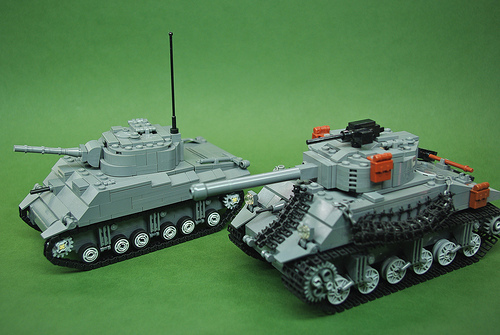 I think this more-basic Brickmania Sherman gets the scale closer to “right,” but by sacrificing many of the details in my version and Dan’s own M4A3. It’s not just an issue of price; I think it’s essentially the same tradeoff between scale and detail that Dan and I made in the opposite direction with our two rather different ambulance designs. The scale-vs-detail point that I’ve belabored now in two separate posts isn’t a criticism in either direction — neither “Proper scale should always win over detail” nor “Certain details must never be left out.” And I won’t include a handy comparison table this time. I do want to point out several aspects of Dan’s “basic” M4 Sherman that I really like — all differences from mine. The front section uses rounded bricks rather than straight slopes, similar to the even-more-rounded front that I first saw on Rumrunner’s M4A1 a couple years ago, but with much simpler parts (another good compromise). The two front hatches close seamlessly. Even with the hatches open, the turret can still rotate 360 degrees. The main gun raises and lowers (“fully posable” as Dan puts it). I think this is my favorite functional detail, and a design I’ll borrow should I revisit my tank again. Even without some key details — like the bogies (and again!) — I really like the overall design, and this feels like a Sherman you could probably build a couple more of once you have your first copy, thanks to Dan’s instructions. Other than the bogies (last time, I promise), my biggest critique is the too-narrow treads — a single set of Technic chain links for each tread. 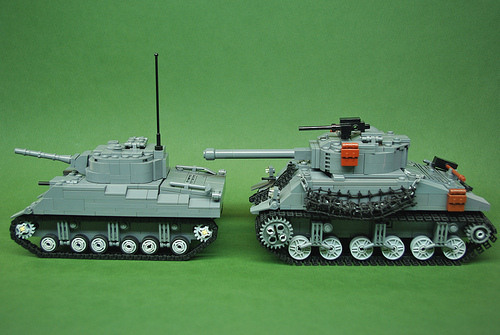 Most Sherman designs use either LEGO’s wider tank treads or two parallel chains of Technic links. The single-chain treads work on smaller tanks (I’ll review one of them shortly), but as part of the overall shape, I can be convinced that it’s an acceptable compromise. And for me, that’s ultimately why this is a positive review — that the design looks great at a lower price by leaving off a few details — and why I can heartily recommend the “plain” Brickmania M4 Sherman. It’s a fun little tank — and little is good when it comes to tanks. 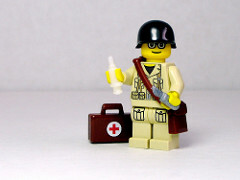 More importantly, it holds plenty of opportunity to make it your own with extra details and “field customizations” like hedge-cutters, applique armor, and equipment built from your own LEGO collection. Brickmania sent The Brothers Brick a copy of this set for review. 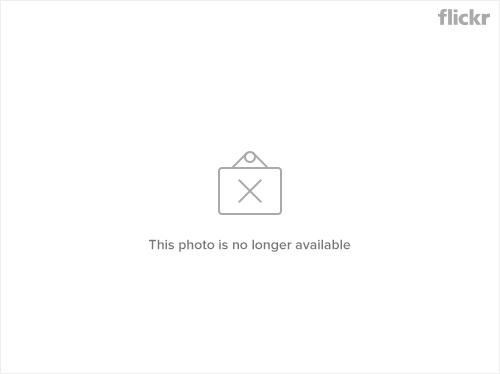 There is no guarantee of coverage or a positive review by providing items to review. It helps when you have a good product, like Dan Siskind does with his Brickmania custom LEGO kits. We’ll have a couple more reviews next week. Immediately after the start of the Normandy invasion on D-Day, Allied forces began a battle for the strategic port city of Cherbourg that lasted more than three weeks. My diorama highlights the aftermath of the battle, when townspeople begin emerging from the rubble, while Free French partisans hoist the Tricolour above their safe house. 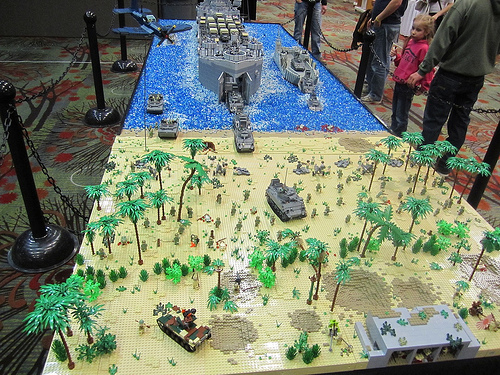 For more photos, check out the photoset on Flickr, and you’ll be able to see this in person in just over a month as part of the Operation Bricklord collaborative display at BrickCon 2010. 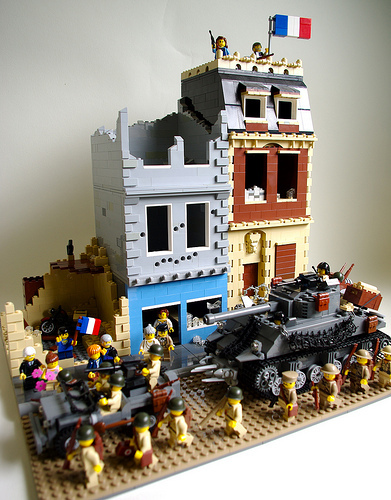 I’ve shared in the past my ambivalence toward violent LEGO, but there’s something unique about World War II that has fascinated me ever since I was little. My grandfather and great uncle served in the US Army during the war, and I grew up in one of the countries that both inflicted a great deal of suffering and suffered deeply themselves before losing the war to the Allies. Over the last couple of years, I’ve really started enjoying the unique challenges presented by building a LEGO model based on something “real.” LEGO has interesting scale challenges, and I think too many LEGO vehicles are too tall or too wide. My M3A1 Half-track has a three/five/seven-wide hood, with an eight-wide cab and crew compartment. It’s my favorite so far (even though the tracks should have four road wheels, not three). I’m less happy with my M4A3 (76)W Sherman tank, which has to be far too tall to capture the right details in the suspension, and I missed the shape of the rear section behind the turret. 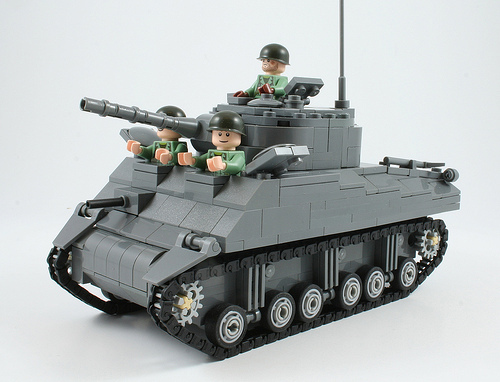 Because it was my first tank, I spent a lot of time looking at tanks built by other builders — especially BrickMania’s M4A2, Phima’s M4A3E8, and Milan CMadge’s M4A3E8. 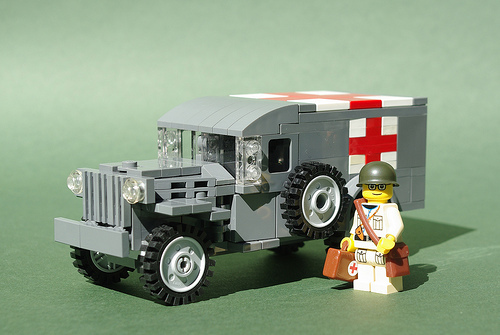 Because I come from a family of pacifist non-combatants and conscientious objectors, my convoy of military hardware wouldn’t be complete without a US Army Medical Corps Dodge WC54 ambulance. 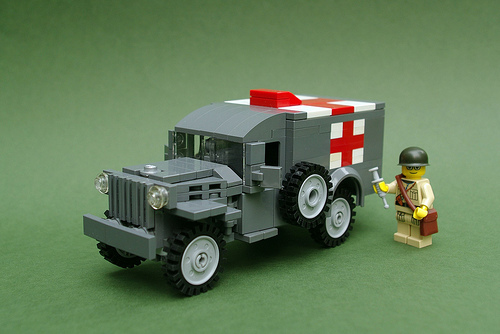 Like the half-track, the ambulance’s hood is three/five/seven-wide, with a six-wide cab. The recessed spare tire seems impossible at this scale, unfortunately, and getting the shape right means it does not fit a fig. 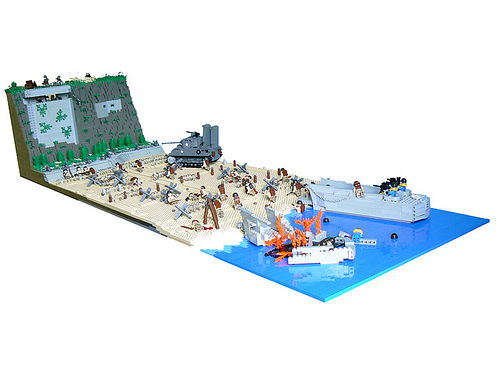 Milan CMadge has been building LEGO versions of the Normandy Invasion for nearly a year now, culminating in his latest diorama featuring a German bunker built into the cliff (complete with interior), a pair of LCVP “Higgins Boat” landing craft (one more fortunate than the other), and even an amphibious Sherman tank. See detail shots on Flickr. 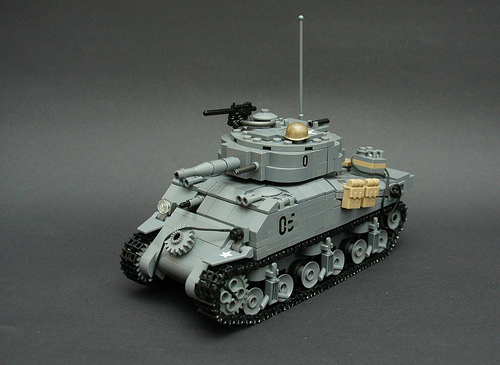 Dan Siskind of BrickMania has just announced that his next custom kit is available for pre-order — the M4A3(76)W VVSS Sherman Tank. I’d never bought any custom LEGO kits from somebody else, but I bought two of Dan’s kits a few months ago. I couldn’t have been more pleased. They’re well-designed, interesting to build (well, except maybe the tank treads, heh heh), and a lot of fun to see how another LEGO builder solves interior structure problems you’d never see in a photo. Though the printed instructions for the two kits I ordered were $10 more expensive, I found them harder to read than the electronic version on a CD. If you’re reading this, you probably have a computer, so I recommend taking the cheaper, more legible route. 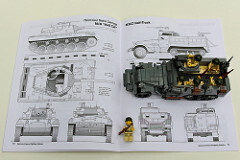 You can pre-order your own Sherman from BrickMania.com.